Michael S. Brown received a B.A. degree in Chemistry in 1962 and an M.D. degree in 1966 from the University of Pennsylvania. He was an intern and resident at the Massachusetts General Hospital, and a postdoctoral fellow with Dr. Earl Stadtman at the National Institutes of Health. In 1971, he came to UT Southwestern where he rose through the ranks to become a professor in 1976. He is currently Paul J. Thomas Professor of Molecular Genetics and Director of the Jonsson Center for Molecular Genetics at UT Southwestern. 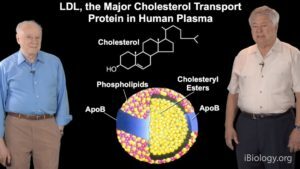 Dr. Brown and his long-time colleague, Dr. Joseph L. Goldstein, together discovered the low density lipoprotein (LDL) receptor, which controls the level of cholesterol in blood and in cells. They showed that mutations in this receptor cause Familial Hypercholesterolemia, a disorder that leads to premature heart attacks in one out of every 500 people in most populations. They have received many awards for this work, including the U.S. National Medal of Science and the Nobel Prize for Medicine or Physiology.